Six years after its initial release, we have a second edition of this popular subject. This is one of the great things about Valiant Wings books. They are as much a modeling book as they are references on the type and so they are fairly easy to upgrade. As with other editions, it contains not only information on the aircraft, but also on available kits, accessories, and books. Build articles on many of the available Tempest kits is also included. The book starts out by providing information on the history of the type, starting with the initial prototypes, of which there are a considerable number. What makes this book special is that there are drawings and photos of these planes, with each successive improvement noted in the drawings. Each plane in this early series has a bit of a history involved with it that gives some pertinent information on the aircraft in question, that includes the colors of the airframe. As the type gets more into production, this information isn't provided, of course. However, we are given information on all the known prototypes. This not only covers the variations on the Tempest, but it covers the Tornado as well. In the airframe section, we are provided with a goodly section on camouflage and markings. Here you'll find several pages of very well drawn profiles by Richard Caruana. All the major production aircraft are covered in this section. As it is in the historical section, there are profiles of those aircraft sold to India and Pakistan. The book then goes into the miniatures section. This is the major area where the book has been revised. Since the initial offering in 2012, there have been several new kits and accessories available so those are included in this edition. All of the 1/72 kits are built by the same person so you get a similar perspective on the builds. Most have the usual mass of aftermarket thrown at them and that includes the Academy and Heller Mk.V kits. The Special Hobby Mk. II already has resin and photo etch in with the kit. For 1/48 we have the new Eduard release and in 1/32, the Special Hobby kit both build out of the box. As you'd expect, you not only get lots of build photos, but a good build description as well. The very last section is an 'in detail' section. Thankfully there are preserved examples of this plane extant, though not really all that many and apparently the majority are the radial engine powered Tempest II. There are many photos of these plus images from the period tech manuals and some period photos. These are used to cover all the different bits and systems of the Typhoon. This is followed by appendices listing and showing photos of many of the various modeling accessories dedicated to the Typhoon. A kit listing with all variations is next followed by a list of accessories, decals and books associated to the aircraft. This is followed by a huge fold out that offers plans in 1/48 scale. I know that many are plans fans and you'll find these to be especially useful as it provides cross section data as well. All in all, and like its predecessor, it makes for a superb book that should appeal to both the enthusiast as well as the modeler. It is a book that I found quite a good read. It is a great effort and well worth the cover price. A book I can most highly recommend to you as a reference. 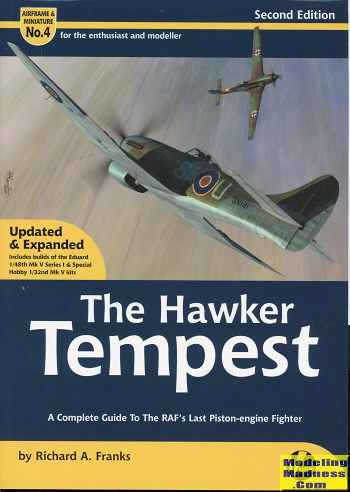 For more on Valiant Wings, including getting this book, visit www.valiant-wings.co.uk. Thank you for the review copy.